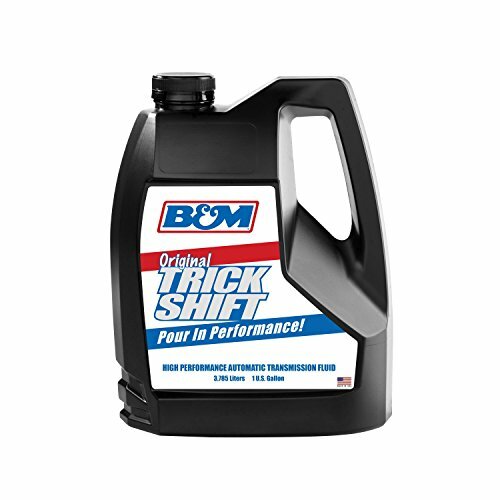 Trick Shift was originally developed by B&M for racing applications. It's become so successful that it's the most popular high performance fluid on the street also! Not an additive, this is the best performance ATF available! A scientific blend of foam inhibitors, pressure agents and shift modifiers that will provide extended transmission life and drastically improve shift feel. Trick Shift is the easiest way to measurably improve the transmission performance of your vehicle. Trick Shift works with all automatic transmissions when a firmer shift is desired. Pour in Performance is not just a catchy phrase - it's reality! It can be mixed with stock-type transmission fluids, however, to attain maximum improvement you should use Trick Shift exclusively. Ideal for towing light trucks and RV applications as well as racing. Not recommended for electronic controlled transmissions. If you have any questions about this product by B&M, contact us by completing and submitting the form below. If you are looking for a specif part number, please include it with your message.